I have been way overdue for shoes. 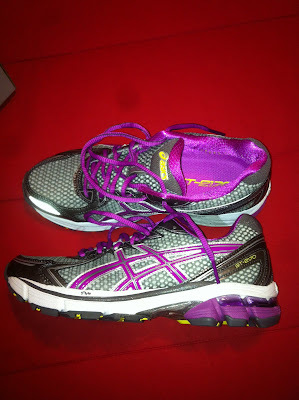 So I finally got some new ones....they are the same as my old ones...Asics just went up a number. So instead of GT 2160 they are now GT 2170. I HATE getting new shoes! Usually I have some kind of issue with them. And I really don't need that in the middle of marathon training. Today's run was not my best. My legs seemed super tired today...not sure if the shoes made them feel that way or if I'm not fully recovered from the 14 miler on Saturday. I also felt like I was running heavy. I always feel that with new shoes though so I'm hoping it gets better quick. I just wasn't in my groove today. Hoping Thursday's run will be a better one! I love those! The color is awesome! !